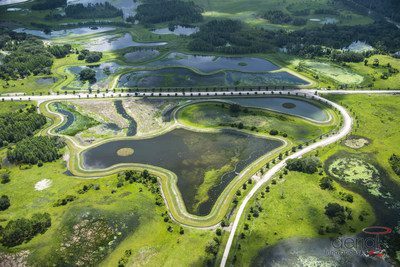 DALLAS – The Water Environment Federation recently awarded a 2018 Project Excellence Award to the Central Pasco County Beneficial Water Reuse Project, the 4G Wetlands, designed by Jacobs Engineering Group Inc. (NYSE:JEC). Since 2010, Jacobs, alongside Pasco County Utilities and the Southwest Florida Water Management District, has provided a full-range of design, permitting and services during construction for the 4G Wetlands, a multifunctional project addressing decades-long concerns regarding groundwater drawdowns in areas affected by public water supply wellfields. The 4G Wetlands consist of a 176-acre groundwater recharge wetland system, the largest human-made system of its kind in the world, constructed on uplands pastures. The system is sized to receive five million gallons of reclaimed water per day to passively recharge the surficial and Upper Floridan aquifers, while protecting water quality. In addition to the benefits to the aquifer and the regional water resources, the project will restore the ecological functions of the historically degraded onsite lakes and wetlands and create 176 acres of new wildlife habitat within the 15 constructed wetland cells. The 4G Wetlands project additionally received five other accolades, including a 2018 National Environmental Achievement Award from the National Association of Clean Water Agencies National Environmental Achievement Award and the David W. York Water Reuse 2017 Project of the Year Award from the Florida Water Environment Association. The 4G Wetlands project accepted its award at the 91st Annual Water Environment Federation Technical Exhibition and Conference held in New Orleans, Louisiana, Sept. 29 – Oct. 3, 2018. Four Jacobs operations and maintenance teams in Florida – in Key West, Pembroke Pines, West Melbourne and The Villages, also received WEF’s 2018 Water Heroes Award at the event for their response work during the 2017 hurricane season.